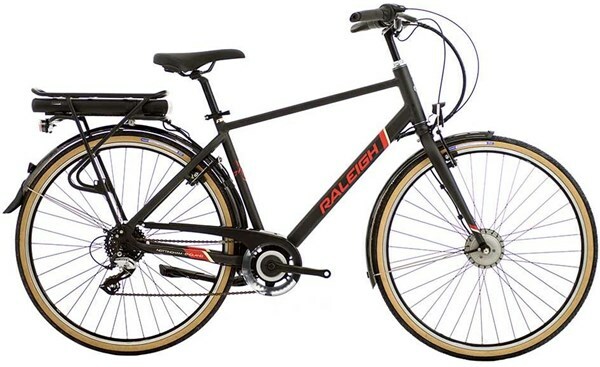 The Raleigh Array E-Motion Crossbar electric hybrid bike is the perfect choice for cyclists who want a reliable and utilitarian bike with an ebike pedal boost. The battery & motor give you plenty of power for effort-free cycling, and you’ll get plenty of range out of the 300Wh battery. The upright seating position is very comfortable and makes the bike easy to control. The new E motion motor adds power to your ride allowing you to travel further faster and more comfortably. The software built into the Emotion system ensures that the Array has a smooth and progressive acceleration to ensure you have a comfortable, controlled journey. The 300Wh battery has a range of 22 to 108 Km depending on the terrain and how much power you use. Shimano's 7 speed gears and easy to use twist shift allow you to find the right gear. CST Zeppelin high volume tyres with puncture protection and reflective stripe make your ride more comfortable and safer.